1.Train your scaffold erectors. 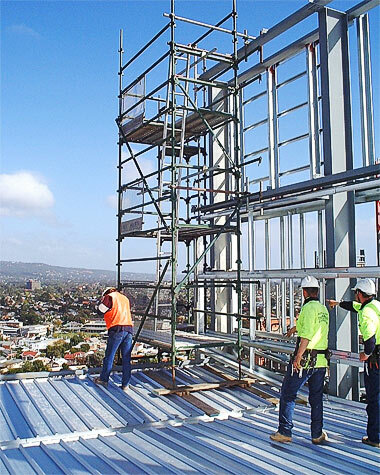 Employees responsible for erecting scaffolds must know what a safe scaffold is in order to build it to the correct specifications. Instruct all employees not to remove a single piece of scaffolding from a scaffold, as they’ll change the design of the structure. This alters the load-bearing capacity of the scaffold and potentially renders the scaffold unstable. 3.Set a load limit for your scaffolding. The scaffold must safely carry the load imposed on it. If in doubt, consult an engineer to work out the correct load limit. Your load limit must be displayed on the erected scaffolding..
4.The scaffold must be equipped with a ‘Safe or unsafe to use’ notice. It must have the date of the last inspection on it and must be signed by the scaffold inspector (this is sometimes called a ‘scaff-tag’). This sign will indicate whether the scaffold inspector has inspected the scaffold and deems it safe or not safe to use. The scaffold inspector must compare the scaffold with all of the requirements of SANS 10085. If it complies with those requirements it’s deemed ‘safe to use’. Remember, all employees who work on, or with, scaffolding must also have a psychological fitness record. The Department of Labour hasn’t disclosed the test required to assess such fitness. Most companies give their employees a ‘work at height’ questionnaire and rely on the medical fitness certificate, which is generally accepted by the DoL. 5.Order the correct amount of scaffold equipment. After you train the scaffold erector and inspectors, get a list of scaffold items from them so scaffolds can be built to the correct specifications on all projects. Alternatively, order the specification SANS 10085, from SABS. 6.Order all the appropriate equipment such as hook-on ladders, trap doors, toe boards, bracing, scaff-tags and all the equipment required by SANS 10085. Always check that you have all the components of the scaffold. If you remember to bring these onto site you’ll save time and costs. If you don’t, the DoL could stop your job after work has already started. 7.Sole plates must be in place. Sole plates are the timber boards that scaffolding is built on and provide a sound foundation for the scaffolding. c. After you make any change or modification to the scaffold (this includes any change to the structure of the scaffold).